Last week DC fans were bombarded with all kinds of cool Aquaman photos and details. There was one other thing that I read about the film in EW that I didn't mention in any of the previous posts that I wanted to highlight here in case you missed it. One of the coolest things that I saw was that director James Wan will get to play around with one of the horror aspects of Aquaman's world. When talking about how the Atlanteans will by riding great white sharks and sea dragons, it also mentions that there will be "trench-dwelling cannibals". Just in case you aren't familiar with who that might be, they are called The Trench and they're crazy! They have the ability to spit a chemical from their mouth that can cause paralysis. 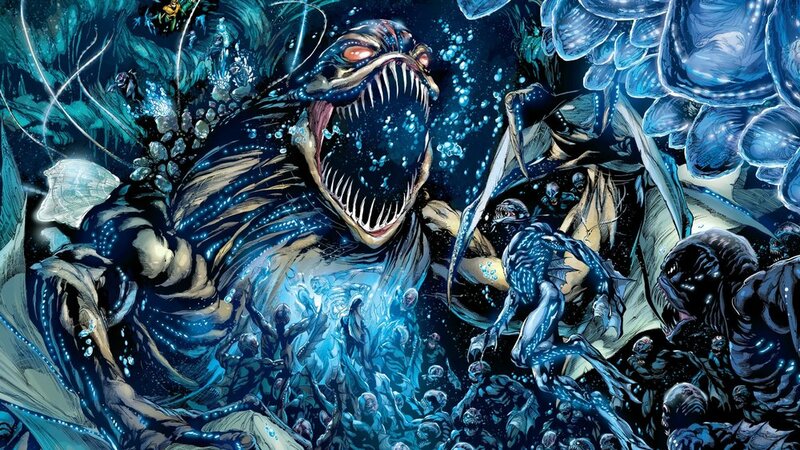 They have superhuman strength, speed, reflexes, speed, senses, the ability to see perfectly in the pitch blackness of the deep ocean, and razor sharp teeth that are able to pierce Aquaman's scale armor and flesh. "The water world my movie takes place in is so separate and so far apart from previous DC movies it’s like I’m making my own sci-fi fantasy film. This is a whole new underwater world nobody has seen before in live action." It's explained that Aquaman starts with Arthur Curry (Jason Momoa) living in a small coastal town in Maine. It's there where Mera shows up to warn him that his half-brother Orm is looking to declare war on the surface world and that's when Aquaman decides to spring into action. Wan also explains that this is going to be more of a fantasy movie than a superhero film, and it's going to have an upbeat tone with a decent amount of humor to lighten the mood. The first trailer for Aquaman is set to be released during Comic-Con, and it sounds like fans are going to be blown away. I'm pretty excited about this movie and I can't wait to see what Wan's version of The Trench are going to look like in the movie.